So I see you want to know a little about me. First off, I’m married to an amazing and virtuous woman! She rocks! Seriously, she does. We live in Alexandria, Va., with our baby, Josiah, located in the Washington D.C. metro area where I try to be as weird as possible. Yes, weird. Why? Because, as author Craig Groeschel says in Weird, normal isn’t working. Normal has too many of us unhappy, stressed out, in debt and disconnected from God. I once was pretty normal. Now I’m fairly weird, and I’ll never go back. Work wise, I do Public Affairs for the U.S. Air Force at the Pentagon. Aim high! I also have my own business, BlueBridge Communication, which I started to help small business entrepreneurs be better marketers and lock-in the freedom of working for themselves. If you like that kind of thing, I blog about small business marketing here. Finally, I’m working hard to fulfill my calling to help other people advance their lives through personal-growth education. 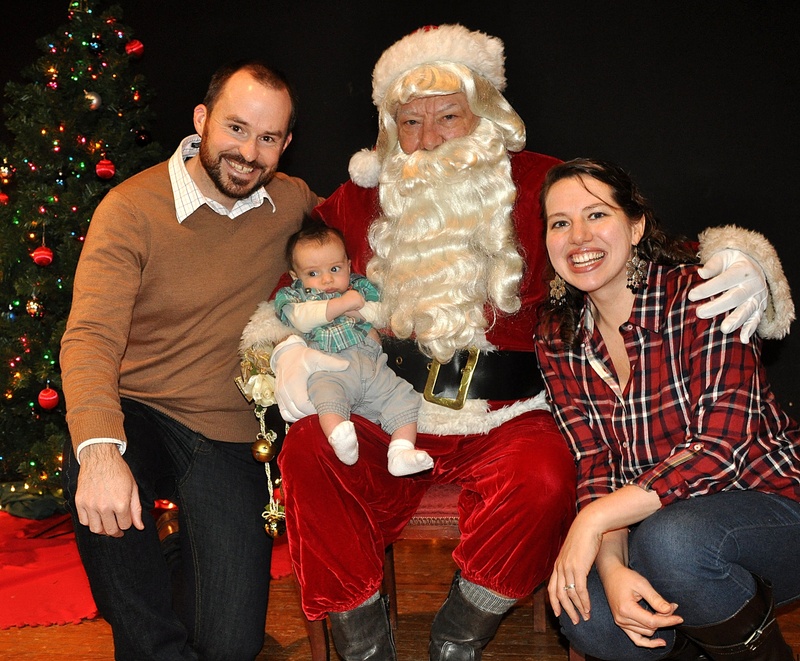 Josiah’s first Santa encounter! December 2012. Hi Joel, I have “seen you a ton on Chris’ blog”, 🙂 so got curious….. I love the idea of story telling, will check out a couple of them, but it’s a great idea, keep it up. We need more people like you willing to help others grow! Wow, thanks. It was a recent transition that I wrestled with for a long time. Silly little human, I am. =) I hope you enjoy it. The intent is for each post to be a continuation of a longer story but with each post standing alone. This way readers of every post are brought into the story and learn along the way, but readers of separate posts have a take-away, too. I my vision is to ultimately have people submit situations or Bible verses to incorporate into the evolving story. This way readers get to help determine which way the story goes. That will be an exciting little deal.